When exporting Harmony scenes from your Storyboard Pro project, you can choose to customize the parameters of the Write node which will create the rendered frames of your scenes. 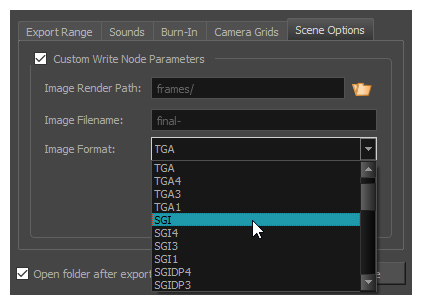 One of the most complex parameters for a scene's Write node is the Image Format, as it has a very extensive set of options. Most available formats are named after their file extension, but some also contain suffixes indicating how they're encoded. For example, while PNG is exported with three colour channels—red, green and blue—and encoded at 8 bits per channel by default, PNG4DP is a variant of PNG with four channels—red, green, blue and alpha (transparency)—as well as double precision, which means each colour channel is encoded in 16 bits instead of 8 bits. Toon Boom's proprietary format for storing vector drawings. NOTE To export TVG files, your Write node must be connected to a vector drawing layer or to a vector composite node. The exported TVG files will contain the vector and bitmap drawing information, but will ignore effects and deformations. A standard image format with lossless compression and support for transparency. TGA files use more disk space than PNG files, but rendering in TGA is faster. A highly capable format with lossless compression as well as support for double precision and transparency. An Adobe Photoshop proprietary format used for image editing. PSD files exported by Harmony contain a single background layer with the rasterized image. A legacy format optimized for NTSC television. The image information is encoded in the Y'UV color space, which means Luma (Y') and Chrominance (UV). NOTE YUV images must be exported in NTSC resolution (720 x 540), or they will not be legible. A legacy format optimized for PAL television. NOTE PAL images must be exported in PAL resolution (768 x 576), or they will not be legible. A Toon Boom proprietary format used by Scan to store scanned image information along with its registration (peg) information. SCAN files are in gresycale. A highly portable image format with high lossless compression as well as support for transparency and double-precision. PNG is typically used for Web applications, graphical user interfaces and image sharing. Rendering in PNG takes more time than rendering in TGA or in uncompressed image formats, but saves a lot of disk space. A very compact image format with lossy compression. It is typically used for Web pages and photo sharing. Because it does not preserve image quality, it is recommended to never render in Jpeg format unless you are exporting stills for a Web page or are making quick render tests. A standard uncompressed image format commonly used on Microsoft operating systems. A legacy Toon Boom proprietary format that stores raw image data with lossless compression. A legacy Toon Boom proprietary format that stores raw image data with lossless compression in greyscale. An image format with many compression and encoding settings. It is often used for image exchange in visual arts and publishing. TIFF images exported by Harmony are uncompressed, encoded on a per-pixel (interleaved) basis in PC byte order. A professional photo format that supports various different approaches to storing colour information, which can be used for storing, exchanging and editing raw information recorded by cameras. It is commonly used in film production. A highly capable deep image format. Each pixel in an EXR file is exported with its Z-depth information. Additionally, if a pixel is semi-transparent, the color and depth information of pixels further back is stored along with it. If your scene has multiplane or 3D elements, this format can be used for compositing your animation with other graphical elements in 3D animation software. Typically, PDF files are used to store, archive, share and print documents. However, Harmony uses the PDF format for its capability to store bitmap images and vector graphics. If the write node is connected to a vector drawing layer or to a vector composite, the exported PDF files will contain the image as a vector graphic. It will ignore bitmap layers, effects and deformations. Otherwise, the PDF files will contain the rendered image as a bitmap. A commonly used deep image format. Each pixel in an DTEX file is exported with its Z-depth information. Additionally, if a pixel is semi-transparent, the color and depth information of pixels further back is stored along with it. If your scene has multiplane or 3D elements, this format can be used for compositing your animation with other graphical elements in 3D animation software. NOTE Exporting in Deep Texture requires RenderMan to be installed on the machine and the path to RenderMan properly configured in Harmony. For more information, see the Setting 3D Renderer Paths topic of the Harmony User Guide.